Nominate a Staff Member involved in Research, Scholarship & Creative Activities! The Distinguished RSCA Staff Award is intended to recognize a staff member who distinguishes himself/herself in supporting the basic research, applied research, scholarly and creative activities of the University. 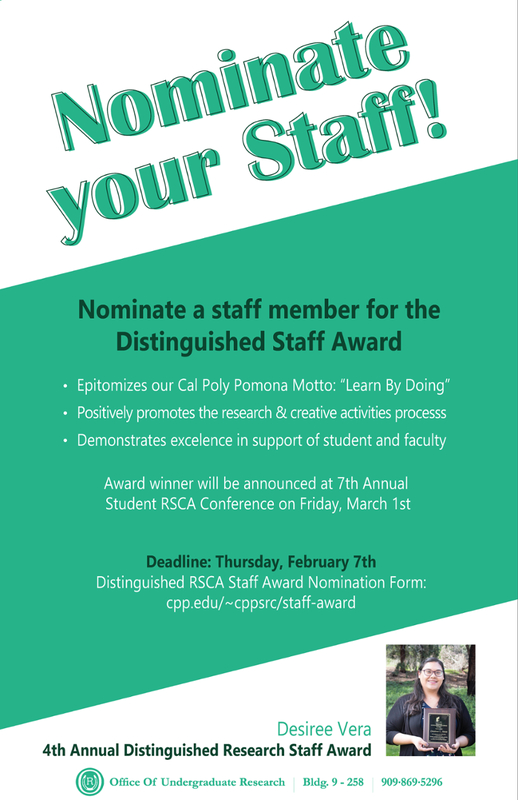 The RSCA Staff Award acknowledges one (1) staff member who demonstrates excellence in support of student and faculty in their research, scholarly and creative activities, making himself/herself indispensable to the success of extracurricular research and creative projects. Such support may include, but not limited to, technical contributions to the execution of the project or administrative support that is invaluable to the smooth operation of research, scholarly and creative activity programs. All Staff members (Foundation and State employees), who are permanent or probationary, full-time or part-time, are eligible for consideration. A staff member may be nominated by another person, group, or can be self-nominated. However, those staff members designated as MPP are ineligible. The Distinguished RSCA Staff Award is conducted yearly and is overseen by the Undergraduate Research Faculty Advisory Committee (URFAC). The RSCA staff award nominations are evaluated by committee members and the award recipient recommended to the Chair for URFAC, who makes the final award decision. The awardee will be announced and recognized at the Annual Student RSCA Conference (CPP SRC), held the first Friday in March. The nomination should be submitted online. Faculty members, staff, and students are highly encouraged to nominate worthy candidates who have made substantial contributions to their research and creative endeavors. Please direct your questions to the Office of Undergraduate Research (OUR-CPP).